The Alto 170 Details: With both power pre-wash and main wash the Classeq Alto 170 dishwasher is 1970mm long, capable of washing up to 170 racks per hour. Complete with double skin, auto timer and Type ‘A’ Air gap. The Alto 170 also incorporates self draining wash pump and radiused corners throughout to ensure optimum hygiene. Access to the interior of the machine is easily gained via full width doors. With power pre wash zone, power wash zone and rinse zone. Alto 170 Power pre wash zone and rinse zone. Alto 170D Power pre wash zone, rinse zone and hot air drying zone. Alto 170CD Power pre wash zone, rinse zone and corner hot air drying zone. Alto 170CP Corner power pre wash zone and rinse zone. 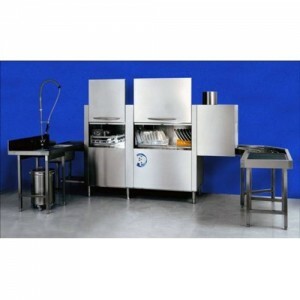 Alto 170CPD Corner power pre wash zone, power wash zone and hot air drying zone. Alto 170CPCD Power pre wash zone, power wash zone, rinse zone and corner hot air drying zone. The Alto is manufactured to the customers requirements. Delivery cost will be determined on survey.